How are Renua, Social Democrats and AAA-PBP doing in the polls? Stephen Donnelly (Social Democrats), Lucinda Creighton (Renua) and Richard Boyd Barrett (Anti-Austerity Alliance-People Before Profit): will good debate performance translate into an increase in party support? The performances of Lucinda Creighton of Renua and Stephen Donnelly of the Social Democrats, along with Richard Boyd Barrett Anti-Austerity Alliance-People Before Profit in Monday’s leaders’ debate seemed to have gone down well – at least judging by some of the public reaction on social media and elsewhere. But how are they doing in the polls? 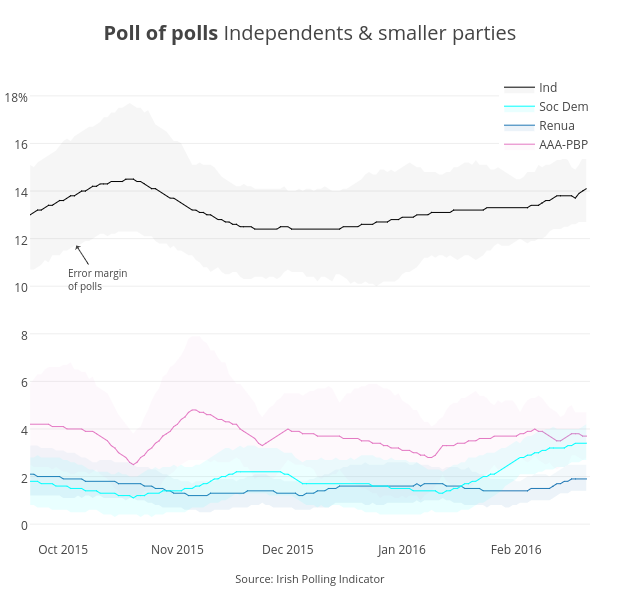 The Irish Polling Indicator poll of polls has broken down the traditional category of “independents/other” to look more closely at the support levels for the individual parties. After the latest polls over the weekend here’s how they stand: AAA-PBP is on 3.5 per cent; Renua 1 per cent; Social Democrats 2.5 per cent; and Independents 13.5 per cent. Pollsters have differed a great deal on the estimated support levels for AAA-PBP over the last year, but current polls are in relative agreement. Renua has been quite consistent between polls while the Social Democrats’ support seems a slight improvement over earlier this year. Independents, including the Independent Alliance, vary widely between the different polls. The most recent Irish Times/Ipsos MRBI poll has them somewhat lower than their poll-of-polls average at 11 per cent, while Red C puts them at about 16 per cent. Again, this pattern is not unique to the latest set of polls: Red C has put Independents/IA higher than other pollsters, in particular Ipsos MRBI, for at least six months. Breaking down the category of Independents/Other is somewhat tricky, as these smaller parties have not been consistently included in polls over a long period. The main model for the analysis remains unchanged, including the Independents/Others category, which we have consistent data for since 2011. We break this down by analysing data from September 2015 until now. This data is analysed on a party-by-party basis. Basically, it takes into account all of the things the regular analysis looks at, but it does not guarantee that party support will add up exactly to 100 per cent (or in the case of Independents/Others to whatever the total of that category is on a given day). This is the limitation of this data, but in practice it does not matter that much. There will be other even smaller parties that are not included in the breakdown. Therefore the total of Independents/Other is likely to be higher than the sum of the four groups in the breakdown. Tom Louwerse is Assistant Professor of Political Science at Leiden University, the Netherlands. He started his work on the Irish Polling Indicator when he held the same position at Trinity College, Dublin, between 2013 and 2015. The Irish Polling Indicator combines all Irish opinion polls for the Dáil into one estimate of public support for the parties. Read more about thepoll of polls and methodology.